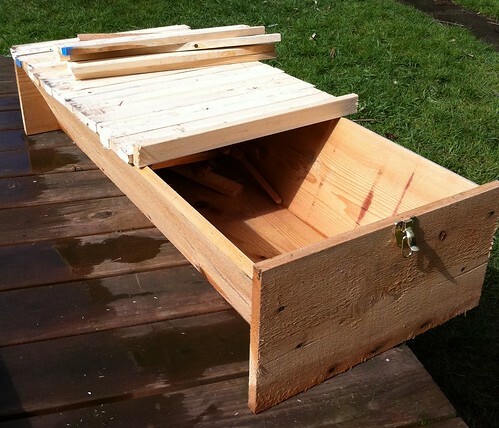 My top bar bee hive is making good progress. 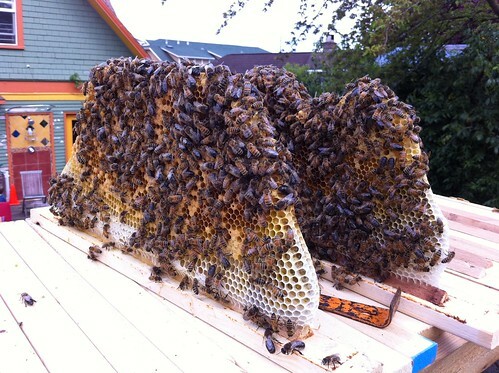 Installed just over a month ago, they’ve built out 12 solid frames of comb so far. Most of that development was in the first weeks. The last couple of weeks, it appears they’ve been adding about one frame per week. In the photo below, you’ve got frames 12 and 13 (that tiny thread of white in the middle of frame 13 is the beginnings of the next round of comb). It’s interesting to see the small cell comb be built. The cells are noticeably smaller than those in the comb built from pre-marked foundation (4.9mm compared to 5.4mm, I’m told). 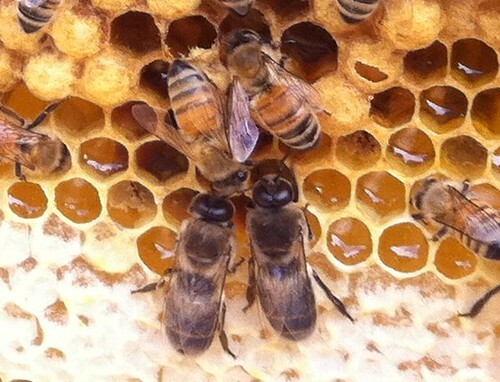 Interestingly, I’m also noticing two distinct sizes of bee on the comb, presumably the larger, darker ones from the package as it was delivered and the smaller, yellower ones hatching from the new small cell comb. 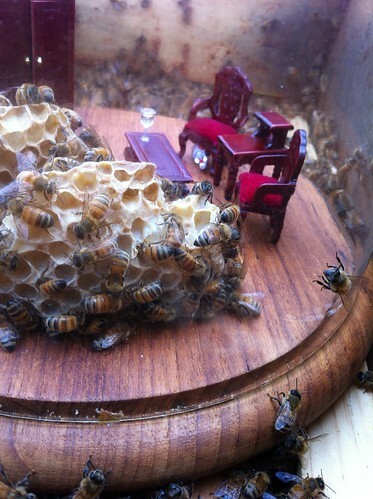 I had thought I had Carniolan bees with a Carniolan queen, but perhaps I’m mistaken. The bees are definitely different colors, so they must be different breeds, right? 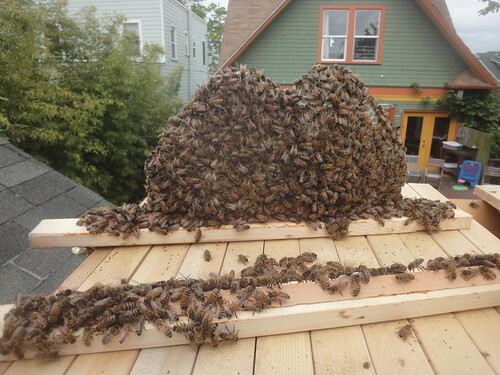 The puzzling part is that my photos of the hive when I installed it shows bees that look more like the smaller, yellower bees than the larger, darker bees. But small cell should lead to small bee, right? 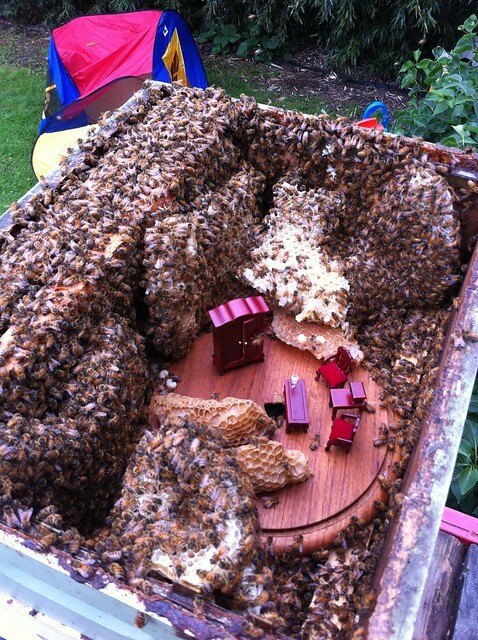 I’m also a little worried about the ability of larger bees to tend to the smaller cells. Really, they’re so large and the cells so small I’m not sure they can fit their fat heads into the comb to clean it, but I suppose they must have, or else I wouldn’t have successfully hatching brood and set honey. 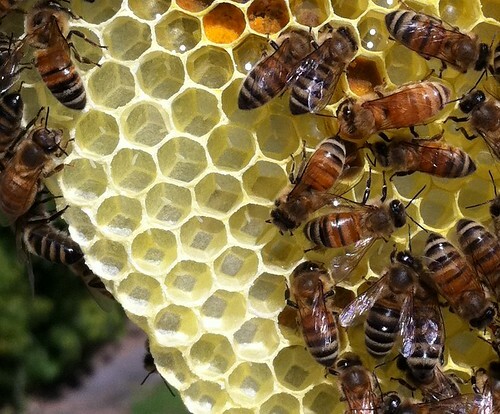 I drove up to Mukilteo last Saturday and grabbed the ferry to Whidbey Island to pick up my three packages of bees. I had to get an early start on it, as we were hosting a food swap later in the day, but a) when you have a 2-year-old, getting up early is par for the course and b) I figured I’d get pick of the litter. I had a bit of trouble last year with the switch to from Italian bees to Carniolans, as the Carnies seemed a bit more aggressive to me that the Italians. It’s not a big deal in a regular bee yard, but my “bee yard” is located 15′ off my back yard deck, home of many a bbq and playground for my son, so it ended up being a bit of a buzz kill (pun intended). To try to balance it out, I decided to go with two Italians hives and just one Carnie. David Neel of the Whidbees swapped out Carnie queens from the package and subbed in Italians for me when I made the pick-up and I made my way back to Seattle in time to swap some honey for other goodies. This year, I’ve got two traditional Langstroth hives going (the kind you’re used to seeing) and one Kenyan top bar (old school, yo). 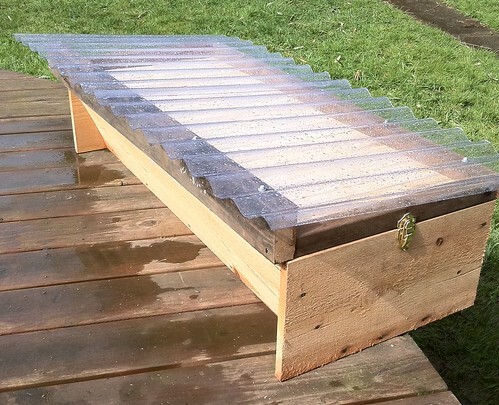 I’m pretty excited about the top bar hive, so that’s probably what you’ll be hearing most about this year. I installed all three last Saturday, putting the Carnie queen in the top bar box. Nothing unusual in the setup there except the feeder: because there’s no “top box” and no traditional entrance, there’s no place for a top feeder or entrance feeder. 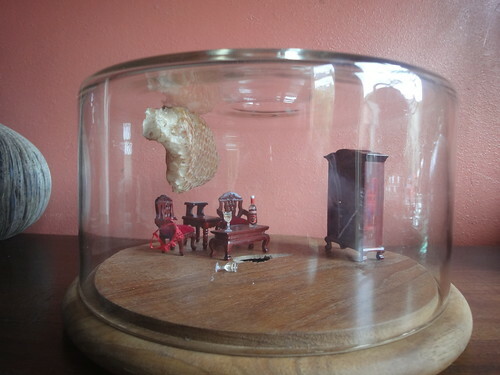 Instead, I just took a mason jar with holes in the top and propped it up on a couple of small pieces of wood inside the hive, far from the door and let it be. Because the queens had been placed with the hives just Friday (and the Italian queens only Saturday), I held off on sticking marshmallow in for the cork until Thursday. 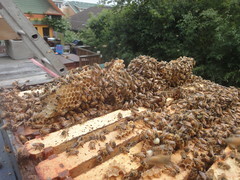 It was exciting to crack the top bar on Thursday: how much progress could the hive make in just five days? Well, about that much. There were probably 2 or three other beginnings of comb in there, as well. I have to admit I was surprised at how much progress they’d made in just a few days, but I guess I shouldn’t be. That’s a lot of bees at work in there. I got stung on my finger as I was trying to set the marshmallow in the top bar hive and the queen escaped into the hive. 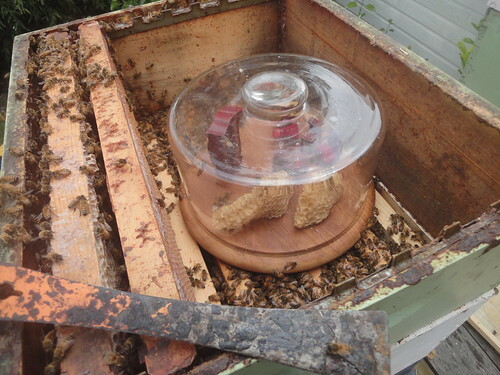 Not such a big deal, though, since that was the Carnie hive and she’d already been with the sisters for five days at this point, but I was more careful with the two Italian hives. Fortunately, when I checked in earlier today, all three hives had the beginnings of healthy laying patterns in them, with the tell-tale speckle of a tiny, rice-like egg at the bottom of each cell (see the second photo below). 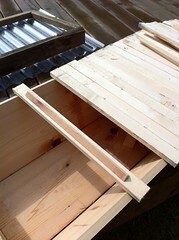 I was amazed again at the expansion of comb in the top bar hive.